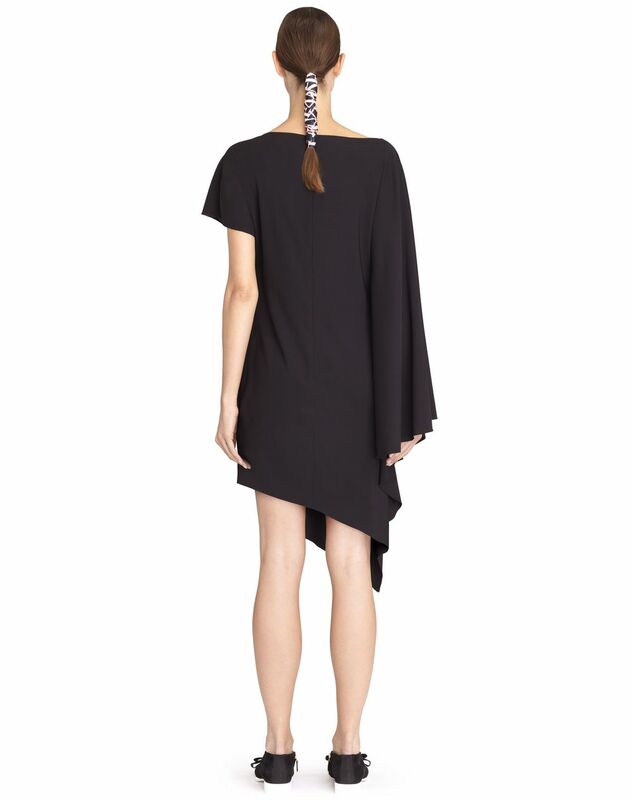 Mid-length dress in black stretch viscose and sable crepe, boat neck, one batwing sleeve and one short sleeve, pleated draping at the hips, satin and twill bow, asymmetrical length, and back zipper fastening. The little black dress, a key theme from the Summer 2018 Collection, is reinterpreted through interplays of volume and texture. The asymmetrical sleeves and hem create a strong silhouette that stands out. The draping detail, adorned with a satin and twill bow at the hips, highlights the waist and adds even more sophistication to this piece. When paired with heels, this perfect dress can easily be donned for a cocktail party. Main material: 100% viscose weave. Lining: Model's measurements: Height: 5’ 9” Chest: 32” Waist: 24.5” Hips: 34.5” Model wears a size 4. Made in France.